Mon., June 13, 2016, 12:59 a.m. 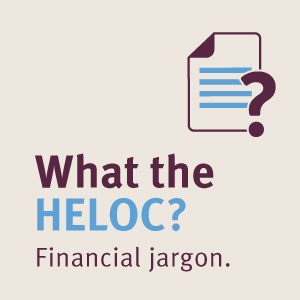 Learn other strategies to make sense of financial jargon here. Excited about your new bridge loan? We regret to inform you that you don’t actually get to take home your own bridge. Jargon is confusing, by definition. And the financial world has its own set of cryptic words. And, yet, it’s important to know the differences among your mortgage options and to understand the fine print that arrives with your credit card. Here are a few terms ― with translations ― that pop up frequently. Amortization. If you’re making regular payments on a mortgage or another loan over a long period of time, you’re amortizing. Who knew? APR. Annual percentage rate refers to the finance charges you’ll pay over one full year for your home or auto loan, on your credit card balance, or for another loan. APY. Annual percentage yield refers to how much interest you earn on your savings account (or certificate of deposit, money market account, or other account where you deposit money) . Bridge loan. This is a short-term loan you might take out until you can get a larger or longer-term loan. Balloon payment. A big payment ― likely more than twice as big as your regular payments ― you make probably at the end of your home loan or business loan. HELOC. If you get a home equity line of credit, you can borrow money as you need it (up to a certain amount). You use the equity in your home as collateral. There are more acronyms and other baffling terms in the financial world, of course. The key to making sense of the jargon is simple: Ask questions. When your personal finances are at stake, you always should feel free to ask for explanations and clarifications from your loan officer, branch teller, or credit card issuer. If they can’t provide answers in plain terms or find someone who can, this may be your signal: Find a new financial institution. Published: June 13, 2016, 12:59 a.m. Updated: June 28, 2016, 12:59 a.m.